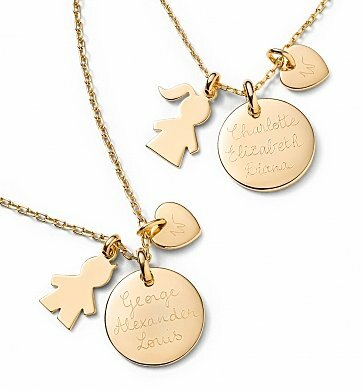 Hanging from an 18k gold-plated 18" chain, the disc pendant will be engraved with your little boy or girl's name, while on the mini-heart, Dad's initial is engraved. All of the engraving is done carefully by hand in a charming French cursive style. Made famous by the Duchess of Cambridge Kate Middleton, this is the perfect gift for a proud new mom. One 18K Gold-Plated 18" Chain with Engraved Disc, Heart and Boy or Girl Charm. Carefully arranged and set in a presentation-ready gift box. Gift ships from the United Kingdom. Free Engraving! Up to 30 characters can be engraved on the disc pendant surface, and 1 character on the mini-heart pendant. Enter information to be engraved using the personalization option during checkout. The first Merci Maman bracelet was crafted in 2007 by Beatrice de Montille, a French mom living in London, from her kitchen table. Beatrice now sits alongside her husband, Arnaud, and their team of 25 in their London studio. 'Merci Maman' translates to 'thank you Mommy' in English and is a nod to the creators' French origins and the original celebration of the mother and child bond. Gift Box Measures 3.5" x 3.5" . Please Note: This gift ships free (standard shipping) via Royal Mail from the United Kingdom. Due to the handcrafted nature of this gift, delivery date estimates are approximate, tracking numbers are unavailable, and all Merci Maman sales are final. Engraved Duchess Necklace is a hand delivered gift. These gifts are delivered by one of our local design centers located throughout the United States and Canada. Same day delivery is available for most gifts when ordered before the cutoff time. The cutoff time for Engraved Duchess Necklace is in the recipient's time zone.